When the Easter bunny hops into town, make sure he knows which New York City holiday desserts you’re longing for. 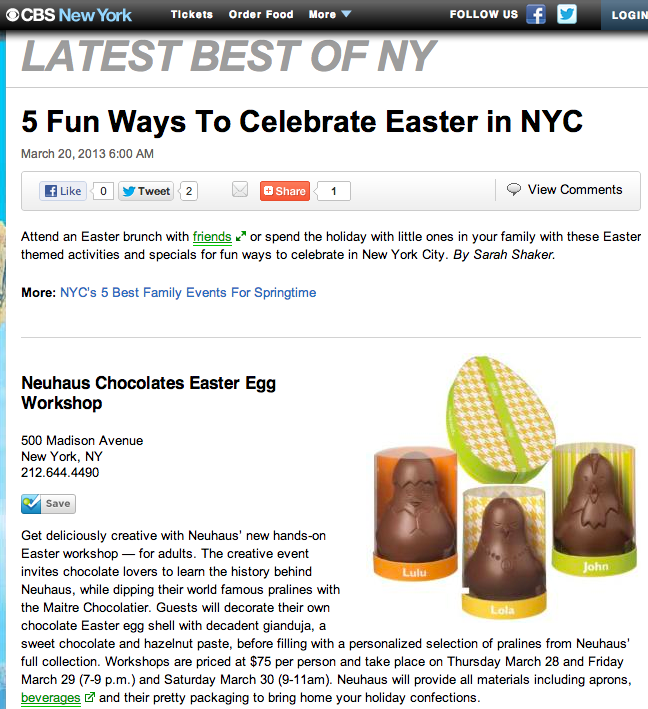 Visit these bakeries and chocolate shops for delicious treats to celebrate Easter with your loved ones. 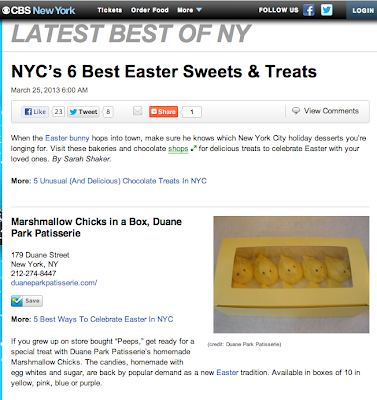 Check out CBS New York for my article on NYC’s 6 Best Easter Sweets & Treats. We’ve all witnessed an awkward best man speech that offends grandma or the maid of honor who gave a generic toast that was clearly swiped from The Knot. Whether you’re the bride’s sister or BFF these tips will help you write the perfect toast for the happy couple. Be yourself. 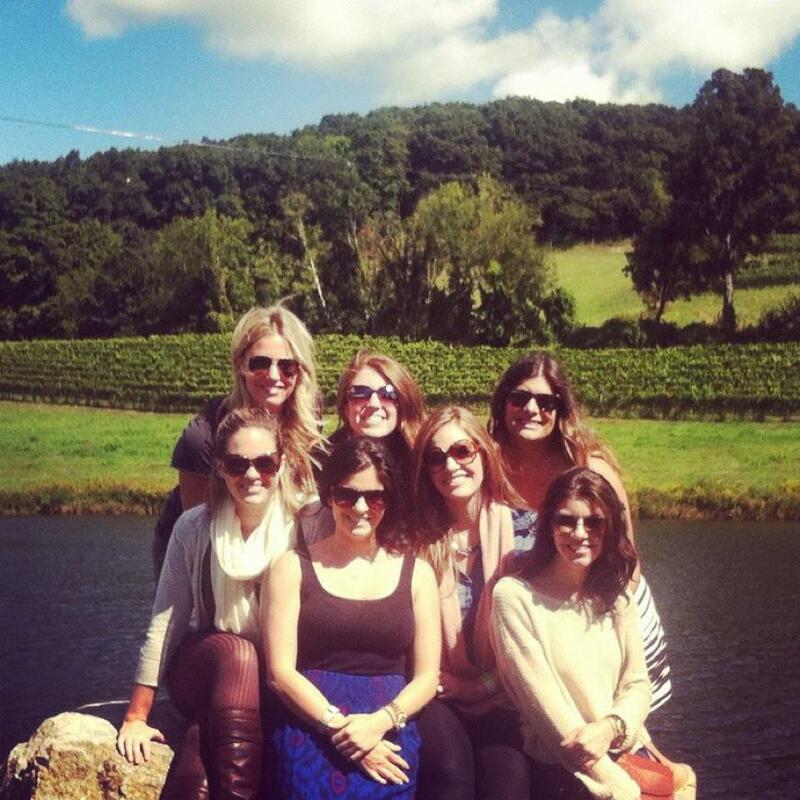 Maybe you’re the gal who makes everyone laugh or you’ve always been the well-spoken confidant who gives great advice. 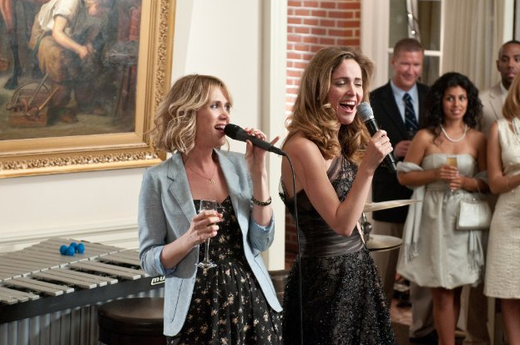 The best wedding toasts are hilarious or heartfelt - know what type of toast fits your personality to write in your natural voice. Be specific. All newlyweds are “in love” and “made for each other.” Instead of boring or obvious descriptions of the couple, tell a story. Maybe the moment when you realized your friend had fallen head-over-heels for her man or the tale of how you introduced the now happy couple at your 30th birthday party. Details help, so the more specific you can be, the better! Remember, it’s not about you. Sure, you’re her maid of honor or bridesmaid because she’s your best friend, but this is not the time for sorority nostalgia. While touching upon some memories you had together, make sure those tidbits lead to a story about the couple or relate to why they’re so great for each other. It’s their day, not a college reunion event. Stay Sober. Save the tequila shots for later in the evening on the dance floor. Don’t get drunk before giving your toast in front of all of their friends and family or you may just embarrass yourself. If you need to calm your nerves, have a glass of wine or champagne, but don’t get wasted before you get on the microphone. Finish with a toast. This may seem obvious, but don't forget to finish your speech with a sentiment that everyone can raise their glass to in celebration of the newly married couple! Check out more Single Girl's Survival Guides to get through those weddings and terrible dates! Venting to your girlfriends about your annoying ex boyfriend, douchey boss or your recent weight gain of 3lbs, is the norm for most ladies. Our best gals are our sounding boards for both daily dramas and serious situations. For those of us who aren't anxious, depressed or traumatized enough to require a paid therapist (and if you are, there's absolutely nothing wrong with that) we rely on our girlfriends to hear every little issue and dish out advice accordingly. Most of the time, girlfriend therapy entails the re-telling of an interaction with your crush, while your friends digest each and every word to translate the true meaning. Forwarding texts, emails, tweets and Facebook posts from Mr. Right Now to get analyzed by your crew can be a daily task. "What do you think he meant by 'maybe'?" "Who is that blonde with the big nose who keeps posting on his wall?" When you’re in a relationship, your boyfriend or husband may be your best friend, but there are just some conversations that are for girls-only. No matter how in love you are, remember to take my advice; always make time for your girlfriends. Yes, it’s officially the spring season, but it still feels like winter out there. Get cozy, warm and full with a heaping serving of chili this winter. 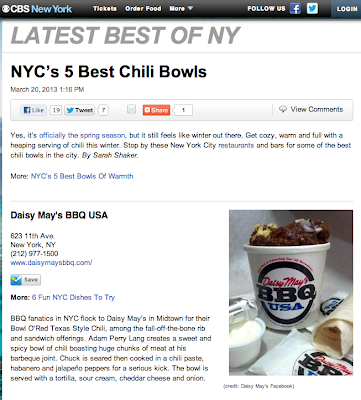 Stop by these New York City restaurants and bars for some of the best chili bowls in the city. 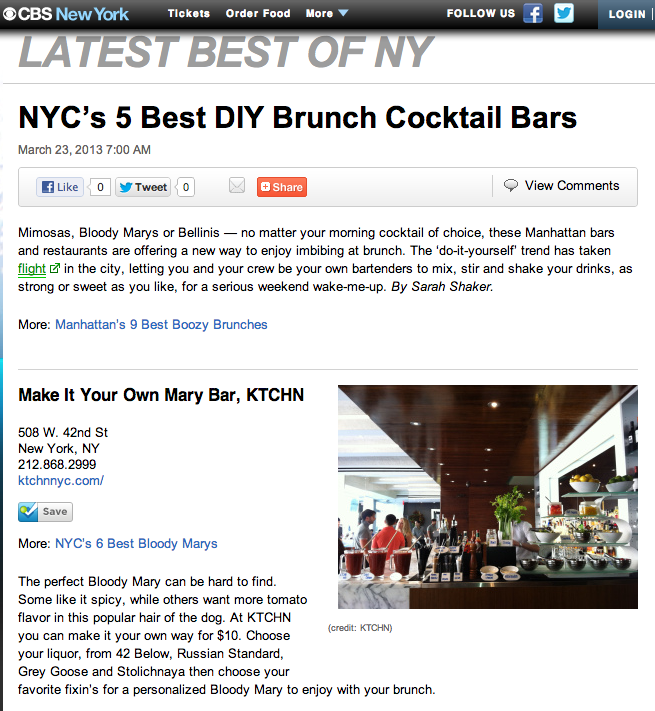 Mimosas, Bloody Marys or Bellinis - no matter your morning cocktail of choice, these Manhattan bars and restaurants are offering a new way to enjoy imbibing at brunch. The ‘do-it-yourself’ trend has taken flight in the city, letting you and your crew be your own bartenders to mix, stir and shake your drinks, as strong or sweet as you like, for a serious weekend wake-me-up. Attend an Easter brunch with friends or spend the holiday with little ones in your family with these Easter themed activities and specials for fun ways to celebrate in New York City. Dining out usually leads to cheating on your low-carb or reduced fat diet. These NYC restaurants and food trucks are offering delicious meals for under 600 calories a serving. Today marks the first day of spring, so let's all get ready for bathing suit season in the Hamptons with these low calorie (and delicious) plates! “Wait. Engaged? Already? But you just met him a few months ago!” You may have been buying rounds of shots on the night they drunkenly met at a dive bar – a mere 6 months ago – but it’s best to keep any judgment about the relationship to yourself once he’s put a ring on it, especially if she’s not your sister or best friend. Trust that she’s an adult and can make her own decisions in love. If she thinks he’s Mr. Right – and he isn’t a criminal or a known cheater – then just send her best wishes on her engagement. Keep the eye rolling for a catch up session with another friend. “I’m so broke after charging my flight to your wedding.” If someone is having a destination wedding, or is inviting guests to celebrate back in her hometown across the country, she knows how much it’s going to cost you. She also knows that not everyone can afford to travel, so go or don’t, but do not make her feel guilty for emptying your savings to attend. 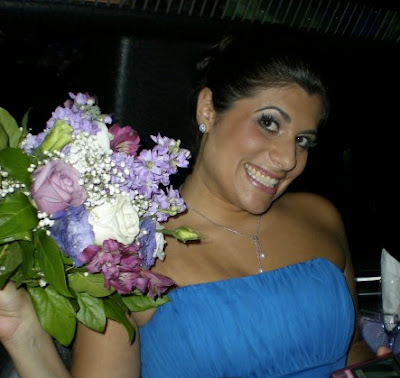 The only time it’s appropriate to bring up the cost with the bride is if you’re politely letting her know that you can’t afford to attend her wedding a few months in advance. She’ll understand when you’re just being honest, rather than bitching about the cost. “Your dress is nice, but…” If the bride invited you to Kleinfeld's with her entourage, then go ahead and be honest to help her find the most flattering gown for her shape in her price range. If you weren’t in attendance during the shopping session, it’s best not to offer your opinion on what she’s purchased to wear on her big day. Adding in your two cents about the style, cut and fit will hurt her feelings when it’s now too late to buy another dress. Everyone has different thoughts on what makes a bride’s gown perfect – lace, mermaid flare, a sash – so keep your criticism to yourself for now and just apply your style tips to your own future bridal fitting. “Red and yellow? But that’s so ‘McDonald’s’, no?” Everyone has their own opinion on the perfect color scheme, prettiest flowers and most romantic venue. It all comes down to personal taste, and everyone’s taste is different. Let her have her clashing color combination or funeral-esque flowers. Just speak up to help her from making any costly mistakes. “You should sign up for that Central Park boot camp to slim down quick.” Suggesting weight loss ideas, like cleanses and new workouts, will always be a sensitive subject with women, unless they’ve asked for the advice. Avoid mentioning self-improvement topics to an already self-conscious bride-to-be unless she comes to you for tips to look and feel her best. 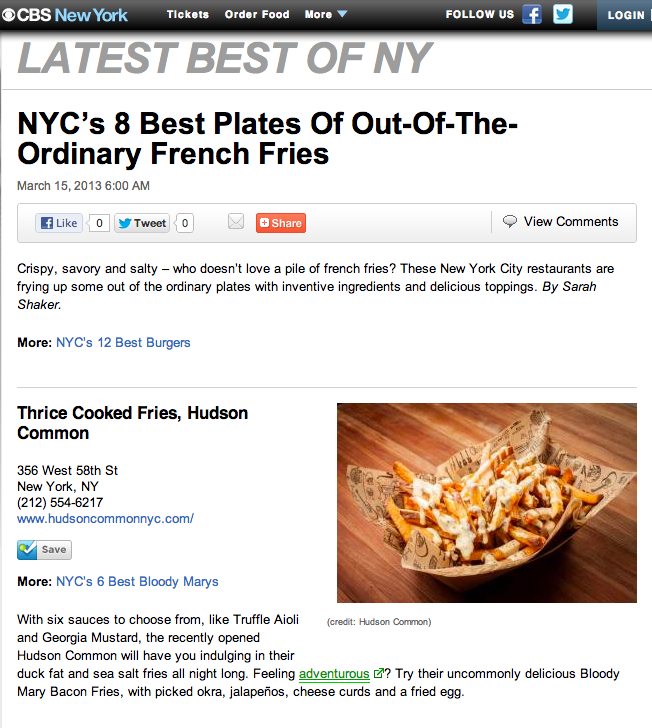 Crispy, savory and salty - who doesn’t love a pile of french fries? These New York City restaurants are frying up some out of the ordinary plates with inventive ingredients and delicious toppings. Dining out usually means cheating on your low carb, reduced fat or dairy free diet. No matter your lifestyle, it’s hard to stay on a strict eating plan while at a restaurant with friends. Temptations from fried appetizers to sugary cocktails are inescapable in New York City. So, what’s a girl to do when she wants a delicious meal that won’t undo the hard work she put in at the gym? 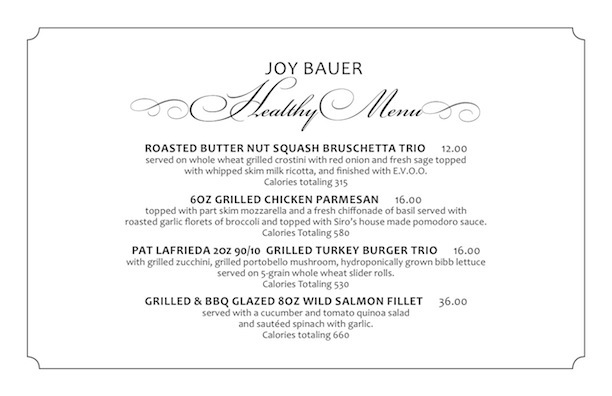 Make reservations for lunch or dinner at Siro’s Restaurant in Midtown for a taste of the newly created Joy Bauer’s Healthy Menu for low calorie and veggie packed plates. 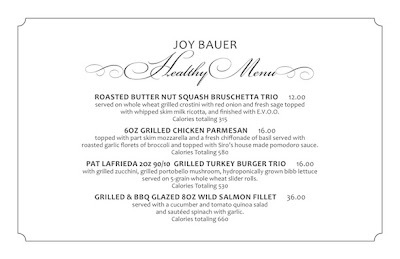 I had the pleasure of meeting Joy Bauer, of Today Show fame, almost two years ago at a blogger lunch for the launch of her book, Food Cure’s. While my mom quickly nabbed her healthy guide from my bookshelf, I personally find Joy to be a daily inspiration both on daytime television and social media, as she’s known to share recipes and healthy tips and tricks for your own kitchen. With a fellow “lady who lunches”, Sarah Spigelman, I was treated to this well-balanced meal at Siro’s. 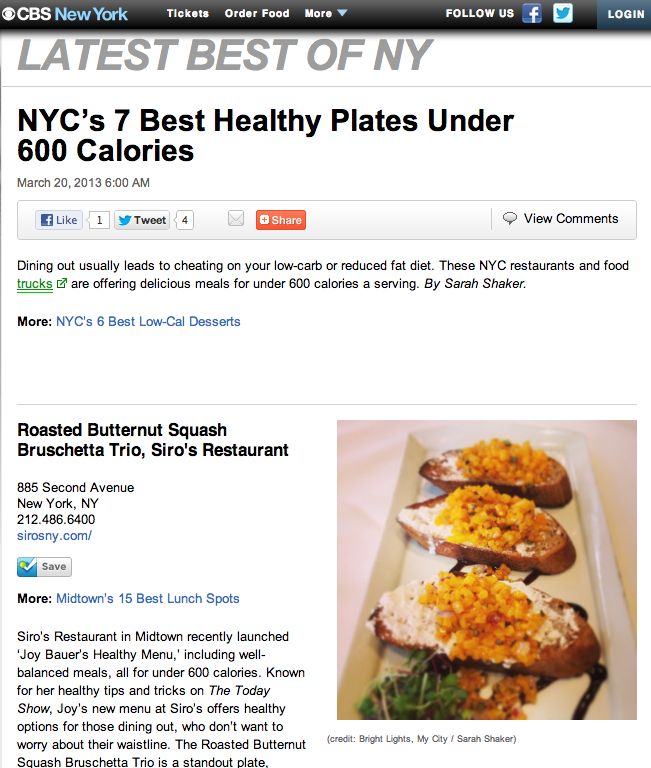 Roasted Butternut Squash Bruschetta Trio was a standout plate, perfect for sharing. A grilled whole wheat crostini is topped with red onion, fresh sage, whipped skim milk ricotta and roasted butternut squash then finished with E.V.O.O. for only 315 calories! Craving Italian comfort food? Grilled Chicken Parmesan is topped with part skim mozzarella and fresh basil to satisfy you without the fried or breaded crust. Roasted garlic florets of broccoli are served with this dish to get in your greens for 580 calories a plate. Pat LaFrieda 2oz ‘90/10’ Grilled Turkey Burger Trio is topped with grilled zucchini, grilled Portobello mushroom, bib lettuce and sits on 5-Grain whole wheat slider rolls for 530 calories. Siro's Restaurant. 885 Second Avenue. 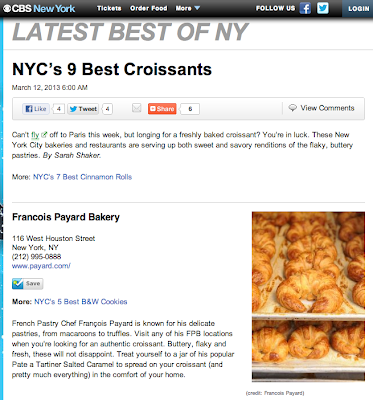 Can’t fly off to Paris this week, but longing for a freshly baked croissant? You’re in luck. 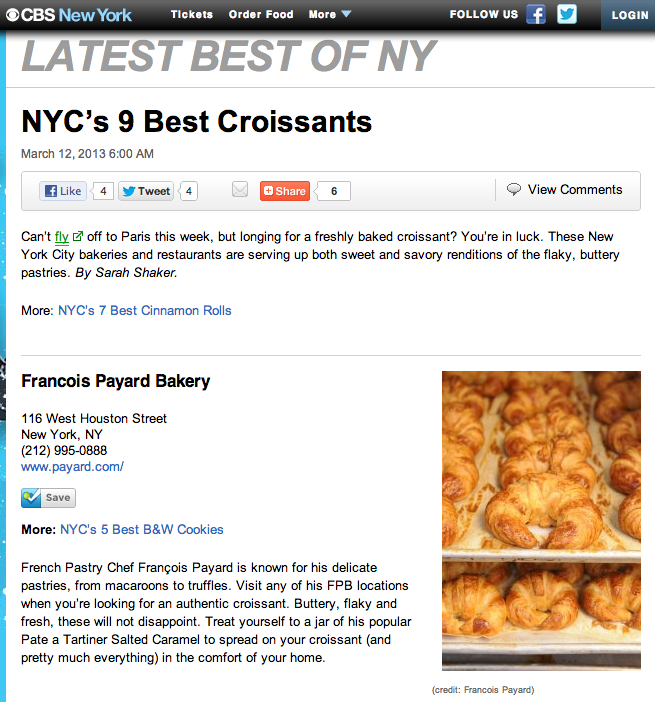 These New York City bakeries and restaurants are serving up both sweet and savory renditions of the flaky, buttery pastries. 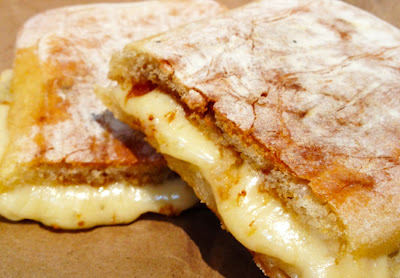 Grilled cheese isn’t just for kids in New York City. Grown-ups are enjoying classy versions of their favorite childhood sandwich at restaurants and food trucks all over NYC with gourmet ingredients and artisanal twists. On March 23 and 24, Openhouse Gallery is bringing back The Big Cheesy, their popular grilled cheese competition, featuring some of New York's best sandwich chefs. This year's lineup includes returning champ Melt Shop, 2011 winner Milk Truck, Lucy's Whey, Murray’s Cheese Bar, Sons of Essex and Tom Colicchio's 'wichcraft. And Sixpoint tallboys will be on hand to wash down all of the melted cheese goodness. Tickets are $25 for one-hour time slots, from 12-7pm, to taste and vote on the delicious competition. For a chance at a pair of free tickets to the time slot of your choice, enter my giveaway! - “Like” Bright Lights, My City on Facebook. - Leave a comment below with your favorite cheesy dish from a New York City restaurant. From mac n’ cheese to pizza, feel free to get creative with your comments!